I have a few minutes here this morning. The laundry has been started, the baby just fell back asleep and Ada is successfully hogging our whole queen bed. Today, Mark and I will own a fridge, oven, dishwasher, toilets, sinks, windows, doors, oh and the big box surrounding it all. Our first home. I know that the home is not the blessing, but that our skills and abilities are. Our children and our marriage, our common interests and individual talents have all taken a lot of work to be how and where they are now. Some days the work doesn't seem worthwhile, I just can't see the reward so clearly. Today, I can. Today, I am blessed, not because we can and are buying our first house but because we are together. Eventually, maybe, probably, some day..
January almost snuck by without me noticing, life can sure get busy. I'm happy I got to spend time with some good friends tonight. 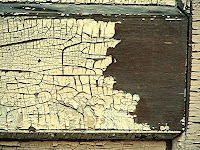 A three color cracked paint frame. Nicole used a black base with cracked gold as the second layer and then added cracked beige over the gold. Very cool. Great earring display made by Emily. The next making of update will be here soon, stay tuned. I just have to pack, move, unpack, breathe and start going again! Can't wait. Make it here, tonight, Friday after 7pm. (except I didn't have leeks, so I used half the amount of green onions). Dice. The recipe says to a 1/2 inch (I like my soup a little more chunky, I also used more potatoes and celery than called for). Combine with water, chopped clams, clam juice, pepper, salt, thyme, bay leaves, and tabasco. Combine flour and butter in a baking dish. Bake for half an hour while the pot is heated to simmering. Add the flour mixture to the chowder and stir. Heat oven to 325, combine flour and butter, bake for 30 minutes. In large saucepan combine all remaining ingredients other than Half and Half. Simmer until potatoes are tender. Stir butter flour mixture into chowder. The mixture will be a little less thick than cookie dough. Remove from heat, add Half and Half, stir until blended. Return to heat and serve warm. Anyone coming to the making of party, anyone? This morning I decided that mother nature is no longer on my good side. And yes, I could've checked the weather, could've watched the news; but all of that went away when Hannah came home and the girls run this house. Definitely a clam chowder day. Clam chowder and Grandma Judd's rolls. Who wants to come over for dinner? m o v i n g (and I'm grinning from ear to ear about it). I plan to host a making of party every month this year. If I can squeeeeze this one into JANUARY I'll do it, but if not, I'll have to do a bonus one on another month. We'll be painting square wooden frames. The frames will be holding chicken wire, on which you may hang earrings or charms. You can even choose to frame a photo rather than the chicken wire, or frame BOTH and it would probably look amazing. I use these frames to display my daughters clip bows, very cute. If you bring a friend, you and your friend will receive a free gift. If you are interested or have any questions you may text me, e-mail me (madison_156@comcast.net) OR leave a comment here. I've allowed for anonymous comments on my page, SO if you don't have a blogspot or google sign-in, you can still leave a comment. P.S. The making of aprons is still being planned but I'm waiting to do it at our new place. So stay tuned! Chicken with her head cut off. When my routine goes the way of the typewriter, so does my sanity. Not that there's anything wrong with that...oh wait, yes there is! Ah, Monday was normal...I think, can't quite remember. Tuesday, Mark's ankle swelled up like a balloon and his mood deflated like that very same balloon a week after the birthday party. He came home from work. Ada's excitement level was through the roof until ten at night. She was smiling from ear to ear while I was ready for "bed night." Wednesday, Mark was home again and I tried to maintain my routine but it quietly stepped out the door when I was not looking. Thursday, today, went to a book club meeting that is not actually until February first. Home now. Baby is sleeping. Ada is enjoying Shrek and some orange fruit. Back to life. Back to reality and I couldn't be more happy. On a side note, I really do LOVE when Mark is home more than usual but it's a total bummer when it's because he's hurt. Mark sure knows how to surprise me with a GREAT night. Bright, beautiful flowers. Guinness. Eat Pray Love. Aquarium with two rock stars. Every day is a miracle, has purpose and is a blessing. It feels good to recognize that. Take time to be thankful. Right now, right now, right now. Really. This is my moment of happiness today. Ada and Mark enjoying sweet rolls and watching The Little Mermaid. Happy. And this is inspiring. Truly Amazing. Nonetheless, Ada was pretty excited and she's been playing with them more than when they were meaningless advertisements. Ended the day with banana muffins, they turned out great. 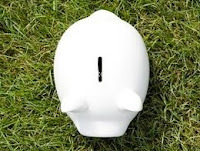 About two years ago I bought this piggy bank for Ada at Tai Pan Trading Co. I think it was only two bucks. It is all white with no features painted or engraved...so no eyes or nostrils. I've been planning to do something to it but never had the old lightbulb turn on until a month ago. A little modge podge, two pages of tampon ad illustrations, a sharpie marker and voila, a whole new pig. Where did I set my motivation? Okay. So I'm sitting here and am a little ashamed to say I'm wolfing down pieces upon pieces of english toffee I made this evening...can't stop. Gross. Here's a little explanation about my end of year and what I'm looking to do this year. Last year, in December, our offer got approved for a house. Excited beyond words. My brother in law and his wife had a beautiful baby, born on my birthday, second time being an aunt. Pretty amazing. 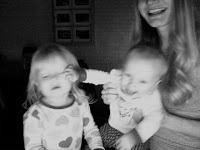 Can't say it enough, motherhood rocks. Ada and I attempted to build a snowman. Hannah handled the snow well for about fifteen minutes and then decided she needed to be inside. Mark pressed his FIRST skateboard. Totally awesome. I'm very proud. My "making of" monogram mugs went WELL. Thanks to all my girls who came out. Can't wait to host the next one...January (MAYBE, crossing fingers). cooking with ADA. Cleaning out our apartment, staying sane, feeling isolated, smiling, wondering, wanting the year to hurry, being happy and loving Mark. AND cutting off all of the loose threads from this magic carpet. Oh, and I stopped eating the toffee midway through the post. Fabulous. What am I doing? Writing, check, relaxing, check...catching up on some TV, celebrity gossip, news, outside world, check. How can I best manage my time? How can I remain in touch with the art world now that I'm a stay at home mom? How can I make sure my time with the girls is meaningful? How can I brush off encounters with rude people? How can I muster up the courage to say it like it is and stick by it? Adios Facebook, hello spending time in the real world. What to do... what to do? Well, I think I'll begin here, blogging...more. Need to get a small notebook to jot down all of the inspiring ideas I have throughout my day. Maybe I'll be updating here more, using it for my cakes. We will see, wont we. Now let my pretty little head relax. I've had a long day getting ready to M O V E. Can not wait. I was a twenty something, stay-at-home, kitchen discovering, art inspired, nature fearing, mother of three and wife of Mark Judd, trying to find peace in every day. Now Im a thirty something, nature loving momma trying to find her place in the world as an individual.